A call to action to make linking a key part of the new academic year ahead. Over the last week of August, there must have been thousands of adults with butterflies in their stomach. Whether you work directly in a school or alongside schools; the start of the Autumn term is a big deal and it can be emotionally draining just thinking about all the things one has to do to be prepared for the school year ahead. As professionals, we are always striving to do our best for our pupils. However, the tidal wave of work and pressured days ahead will sometimes make it difficult to think about the things we could be doing to make learning more experiential and creative. Hence, now is a good time for education professionals to make time to reflect on some new academic year resolutions. Linking is an ideal way to get pupils out of the classroom and give them an opportunity to tentatively venture out of their comfort zones. At the heart of linking lies a very simple idea; it’s giving pupils an opportunity to meet others who they wouldn’t normally have a chance to interact with in a meaningful way. There is clear evidence that such engagement leads to less prejudice and more tolerance. Creating harmonious societies or simply trying to save the world may be a resolution that is simply too big for us to take on; especially on a wet Thursday afternoon! However, taking small steps to facilitate opportunities like linking will inevitably lead to positive outcomes. As the late child psychologist and educator Haim G. Ginott said: “Children are like wet cement, whatever falls on them makes an impression”. You are most welcome to also get in touch with us by phone on 01274 439248 or by email: info@thelinkingnetwork.org.uk. We really look forward to hearing from you! 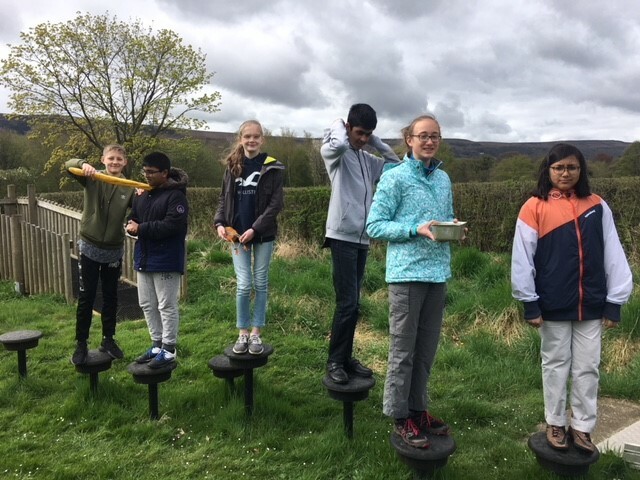 In the picture Year 8 students from Bradford Grammar School and Oasis Lister Park Academy are taking part in a morning of team building activities at Nell Bank Outdoor Education Centre. Next: It’s Good to Talk….